KUWAIT: Kuwait Finance House (KFH) Chairman, Hamad Abdulmohsen Al-Marzouq, said that KFH has, by the grace of Allah, realized a net profit of KD 227.4 million for the year 2018 for KFH shareholders compared to KD 184.2 million last year i.e. an increase of 23.5 percent. Total financing income reached KD 862.1 million, i.e. an increase of 16.4 percent compared to last year. Net financing income reached KD 527.3 million, i.e. an increase of 18.5 percent over the last year. Net operating income increased to reach KD 453.5 million, i.e. a growth of 11.1 percent over the last year. KFH continued its strategy of focusing on cost optimization and maximizing revenues, where total operating expenses decreased by KD 12.6 million i.e. a drop of 4.1 percent over the same period last year. Cost to income ratio dropped for the fourth year in a row to reach 39.2 percent for the current year, compared to 42.8 percent for the last year. Earnings per share for 2018 reached 36.36 fils compared to 29.46 fils in 2017 i.e. an increase of 23.4 percent. KFH distributions for the year 2018 were as follows: 3.125 percent for “Al-Khumasiya” investment deposit, 2.625 percent for “Al-Mustamera” investment deposit, 2.1 percent for “Al-Sedra” investment deposit, 2.5 percent for the 12-month Dimah investment deposit, 2.3 percent for the 6-month Dimah investment deposit and 2.125 percent for long term investment plans and 1.25 percent for saving investment account. The Board of Directors has proposed 20 percent cash dividends to shareholders and 10 percent bonus shares subject to general assembly and concerned authorities’ approval. Total assets increased to reach KD 17.770 billion, i.e. an increase of KD 412.3 million or 2.4 percent compared to 2017. Financing portfolio increased to reach KD 9.385 billion, i.e. an increase of KD 169 million or 1.8 percent compared to 2017. Depositors’ accounts increased to reach KD 11.780 billion, i.e. an increase of KD 183.6 million or 1.6 percent compared to 2017. Shareholders’ equity increased to reach KD 1.894 billion i.e. an increase of KD 21.7 million or 1.2 percent compared to 2017. KFH’s capital adequacy ratio (CAR) reached 17.47 percent, (after the proposed dividends) i.e. higher than the required limit of 15 percent, thus reiterating the strength of KFH financial position. Al-Marzouq said: “In line with the set plans and the overall performance of the Group, growth in 2018 profits have been achieved despite the challenges posed by the markets and economic developments locally and internationally. KFH is consistently progressing towards achieving sustainable profitability by focusing on operating profits from core banking activities, matching revenues from local and foreign markets. KFH has been able to maintain the diversity of profitability, while breaking new grounds and rolling out, innovative and competitive products. Last year, we achieved great success on all levels, demonstrated by our financial indicators and qualitative achievements, not to mention the professional performance adhering to the banking system regulations and Sharia principles, in accordance with the strategies and plans of KFH”. He added that the profit indices calculated on an annual basis indicate that most of the results of KFH have been increased, most notably the return on assets, return on equity, return on capital, as well as earnings per share and total operating income. KFH has been able to maintain profitability rates achieved in 2017 and increased them in 2018, despite the adoption of new standards with strict financial reporting controls, notably IFRS 9. Accordingly, the results confirm our potential and what we can achieve in the future. KFH will work to maintain a stable growth rate, implementing a prudent policy, enhancing precautionary provisions and its solid financial position. Al-Marzouq pointed out that: “2018 objectives focused on achieving progress by improving internal efficiency, rationalizing spending, offering new innovative products, applying the highest standards of quality and governance, and adopting financial technology”. He considered that KFH’s success in achieving the previous objectives represents a pivotal shift in its strategy towards implementing its strategic vision and strengthening its position to be the strongest and most influential financial institution locally and internationally. He stressed that the major reforms implemented at the organizational and operational levels have led to strengthening the Bank’s leadership in the market while improving its internal capabilities, such as the development of banking technology and technical infrastructure to keep pace with “e- banking” through a variety of competing and integrated products. KFH invests heavily in human resources by insuring flexible and professional structure of expertise, and attracting and empowering the promising human cadres. In addition, KFH succeeded in expanding its branch network, developing the e-service channels, improving the credit risk management to ensure the quality of assets. These developments have resulted in a reduction in the rate of non-performing facilities to the lowest levels. The results of the stress tests proved the ability to withstand shocks in credit, market and liquidity risks, according to a wide range of scenarios backed by sound banking practices. Al-Marzouq said: “Spending on building IT platforms, infrastructure investment, and the front end of technology has characterized KFH’s business and activities in 2018, which we can call the “FinTech Year”. 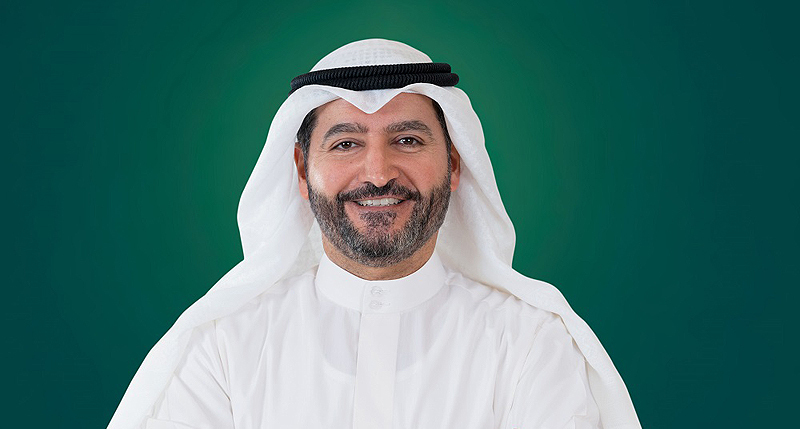 KFH succeeded in providing 20 high-tech banking services, most of which are unique in Kuwait, and has established a competitive position in the banking sector. KFH culminated its efforts to operate in Ishbiliya its first fully-automated 24/7 e-branch with an advanced and wide range of technical devices and self-service tools under the title “KFH-Go”. The e-branch provides more than 30 services representing about 80 percent of the services provided by the traditional branch. Also, KFH launched its Chatbot service in cooperation with Microsoft, to improve interaction with customers who can use this service through different KFH channels such as KFH.com and the mobile app KFHonline. KFH launched a centralized SWIFT network system for global payments at the group level. For the first time in Kuwait, KFH launched Visa Checkout to facilitate fast and secure online purchases. Along with developing the other ATMs, it also launched the mini branch XTM. Moreover, the bank offered seven new services on the XTM, some of which are the first to be offered domestically, including QR cardless withdrawals with the possibility of updating the information, activating the new and renewed debit cards and changing the PIN. The Bank introduced a fast cross-border transfer service (KFH Xpress) and an instant remittance service using RippleNet. Al-Marzouq explained that technology has become the engine of banking services and their main arena of future growth. He expressed his confidence that there are three major pillars which are the internet and its growing use, smart phones and their expanding reach and banking services that are keeping up with both. These pillars will be the major driver of the development of banking and the shedding of its conventional concepts and forms in the future. He pointed out that KFH is seriously aiming at embracing Artificial Intelligence and robotics in banking transactions and operations with a view to boosting productivity and cutting costs. KFH has signed agreements with world famous agencies the results of which will become tangible this year. Al-Marzouq added that 2019 will witness a strengthening of KFH’s competitiveness which is already increasing in the local and international markets, a goal which is in line with the ongoing efforts to realize sustainable profits and focus on the customer. He stressed that excellence of customer service, innovative Islamic financing and improvement in the level of operations and risk management will maintain the bank’s legacy and its reputation as the largest, most trust-worthy Islamic bank and the most capable of offering shareholders and depositors the highest returns and the best services. He added: KFH has maintained its credit rating with a stable outlook including the Group’s ability to grow, confront challenges and pressures and meet its commitments. The Bank has also won 22 awards from illustrious international agencies, indicating appreciation in several aspects and confirming its ranking as the safest Islamic Bank. Al-Marzouq expressed his confidence in the ability of the banking sector to play a major role in supporting the development plan in line with the government commitment to continue its capital spending and project offerings which would support the private sector and create economic diversification. He noted that the domestic banking sector remains in a position of strength aided by abundant provisions along with sufficient capitalization, increased net profits, high liquidity levels and operational efficiency. All these will be tested in 2019 when the potential of banks for growth and ability to attract and operate funds will be tested under expected challenges in the operational environment and in the regional and world economic and geopolitical shifts as well as oil-price volatility. Al-Marzouq affirmed that the Kuwaiti banking sector will be able to improve the level of banking services to compete at the global level, thanks to its banking figures, the Central Bank of Kuwait (CBK), the Capital Market Authority (CMA) and other regulatory authorities. He also thanked shareholders and customers for their support and trust in KFH operations and activities and valued highly the efforts and excellent performance of the executive management and staff.